“We want peace; we don’t like blood. But I want to ask you a question — if there is no hope, what do you think will happen?" DHEISHEH REFUGEE CAMP, West Bank — Except for a few anxious tears, the first day of class at Dheisheh Basic Girls School was an exuberant occasion. Teachers kissed each other on both cheeks. Teenagers in green-and-white striped smocks hugged. Younger girls — white rubber bands and bows keeping ponytails and braids tightly in place — held hands. Some of the smaller students looked set to topple over under the weight of shiny new “Frozen”-themed backpacks — clearly the favorite accessory in this refugee camp in the Israeli-occupied West Bank. But the future of the school and hundreds of others look uncertain from the end of this month. On Friday, the Trump administration ended decades of financial support for the U.N. Relief and Works Agency (UNRWA) — which was set up to serve Palestinian refugees after the creation of Israel in 1948. The U.S. has long been the organization's largest donor, but the decision leaves a funding gap of more than $200 million. The move comes as President Donald Trump's son-in-law and senior adviser Jared Kushner tries to craft the “deal of the century” between Palestinians and Israel. 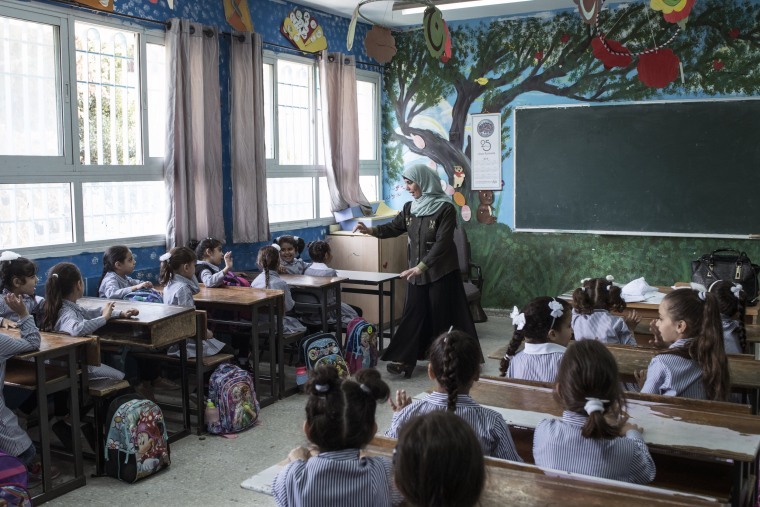 UNRWA schools provide education to 515,000 children. The organization also provides health care, relief, social services and other types of help to almost 2.1 million Palestinian refugees in the West Bank and Gaza Strip, 2 million others in Jordan, 560,000 in Syria and 450,000 in Lebanon. Chris Gunness, the group's spokesman, said that “some of the most marginalized and vulnerable people in one of the most volatile regions on the planet are being put under terrible pressure” by the elimination of funding. “Whole communities are being deprived of hope and the belief in a dignified future,” he said. Fatima Al Qaisi, the principal of Dheisheh Basic Girls School, proudly mentions that Hanan al-Hroub, who in 2016 won the $1 million Global Teacher Prize for excellence in teaching, graduated from there. Al Qaisi said the school’s importance to the refugee camp could not be underestimated. “The schools are the center of the community," she said. "Not part — the center." In a letter to his European counterparts seen by NBC News, Maas added that Germany had already contributed 81 million euros ($94 million) to UNRWA this year, but was planning to “provide an additional amount of significant funds” in the wake of the U.S. decision. In 2017, America covered about one-third of the agency's budget of $1.1 billion. In January, the Trump administration provided $60 million compared to $364 million in 2017, and called on Palestinians to restart peace talks with Israel. Washington's move has been cheered by many Israeli officials who say UNRWA is a bloated organization that is biased against Israel. On Sunday, Israeli Prime Minister Benjamin Netanyahu described UNRWA as a "refugee perpetuation agency," stating that the U.S. had "done a very important thing by halting the financing." The State Department said the U.S. would look into "new models and new approaches" that aimed to provide Palestinian children "with a more durable and dependable path towards a brighter tomorrow." But America's UNRWA funding cut is also seen by many here as a blow to the concept of the right to return — the strongly held belief among Palestinians that they should be able to go back to homes their families were driven out of or left when Israel was founded in 1948. In crowded and dusty Dheisheh, south of Bethlehem, nobody is allowed to forget where they originated. The camp is roughly divided into neighborhoods according the 45 villages the original inhabitants hailed from. A wall on the outside of a community center lists each of these places in black and white paint. Ola Masalmeh was born and raised in Dheisheh sends her 6-year-old daughter Asinat to the local UNRWA school. Because UNRWA represents Palestinians, she said it served as a protection for the right of return — or at the very least, an equitable payback for generations of hardship. “I will live in the refugee camp and I will stay as a refugee until the day I return to my village," the 42-year-old housewife said. Khalid Al Saifi is a former math teacher who now runs after school dance, athletics and music programs. He feels the American UNRWA cuts were motivated by politics and not a desire to bring about a just resolution to the plight of Palestinian refugees. The normally effervescent 57-year-old was flushed and anxious Saturday — the day after the U.S decision. He said it would inevitably lead to violence. A failure to reach a political solution to Palestinian statelessness, and end the military occupation of the West Bank and the blockade of desperately poor Gaza has demoralized Palestinians, Al Saifi said. America's decision to move its embassy to Jerusalem and recognize the city as the capital of Israel was fueling anger in Dheisheh, he added. So the UNRWA decision felt like a last straw, Al Saifi said. A reminder of Palestinians’ sometimes bloody national struggle is never far away in Dheisheh. Just outside the girls’ school is a graffiti mural of Ayat Al Akhras, who on March 29, 2002 at the age of 18 became the youngest female Palestinian suicide bomber. Born in Dheisheh, Akhras killed two Israelis — one of them a 17-year-old girl. Bissan Abu Ajamia graduated from Dheisheh Basic Girls School, and says she has spent her life since trying to avoid politics. “I just want to get married and have babies,” said the 21-year-old who is studying to become a special education teacher. But things haven’t worked out the way Abu Ajamia had hoped. On the day of her engagement party six months ago, she said Israeli soldiers burst into her home and took away her fiance after protesting. He remains in prison. Two of her younger brothers have been shot by Israeli soldiers who make frequent raids and incursions in the camp, according to Abu Ajamia. She sees UNRWA as essential in maintaining a modicum of calm. F. Brinley Bruton and Lawahez Jabari reported from the West Bank, Paul Goldman from Tel Aviv, and Andy Eckardt from Mainz, Germany. Paul Goldman and Andy Eckardt contributed.